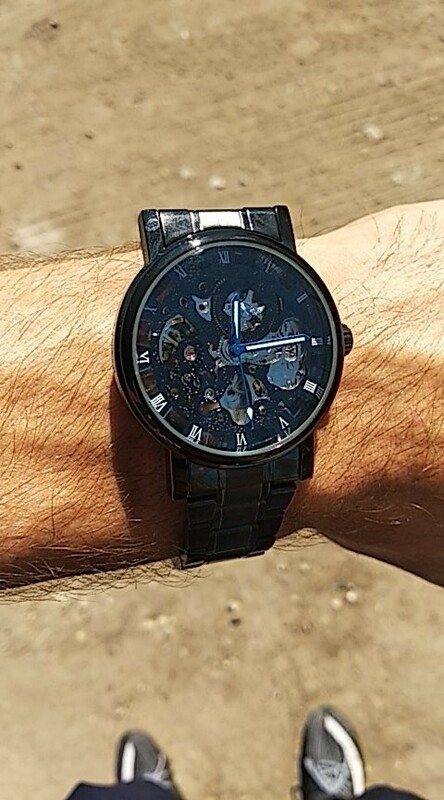 From T-Winner comes this sporty and fashionable skeleton watch for men. Perfect for everyday use and formal occasions such as work, meetings, parties, interviews, etc. Black in colour. Has an Automatic Self Winding Mechanism so as long as it is being worn, it will continue to work. The skeleton dial allows you to see the inner workings of the watch while still displaying the time. The case is part made of stainless steel, the dial window is made of Hardlex and the band is made of stainless steel making the watch resistant to wear and tear. The overall result is stunning. The perfect gift for a friend, a loved one, family member or of course, you can simply treat yourself. Es un poco más pequeño de lo que parece y la correa no es tan buena.